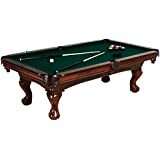 A billiards table is a stylish classic addition to your home’s entertainment collection. It is sure to be a hit with family and friends, alike and will be the center of attention at all social gatherings you host in your home. 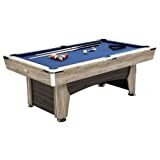 For those who enjoy a social game that requires strategy, skill, and coordination a pool table is a worthwhile investment that will provide you and your family hours of competitive fun and excitement. 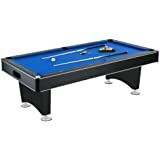 This page contains some affiliate links and Foosball Revolution may be compensated if you make a purchase after clicking on the links. 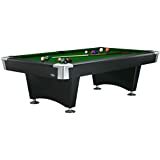 Size is one of the most important factors when deciding on the right pool table for your home. A player should be able to shoot from every side of the pool table, although it is rather common for home tables to have one “tight spot”. You should keep in mind that you are not so much measuring for the table itself, but rather how much room you have from the end of the cue to the wall. A cramped position can take the fun out of playing pool. 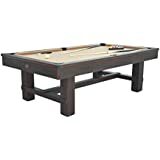 A regulation size pool table measures 9-foot by 4.5-foot. To comfortably play on a table this size you would need a room that measures 18′ 4″ x 14′ 6″, at a minimum. 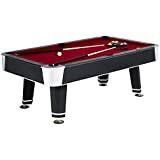 Standard pool tables come in seven foot, eight foot, eight and a half foot, and nine foot long sizes. The most common size for an in-home pool table is eight foot. This chart is a helpful reference in deciding what size table would best fit your room. Next, you want to consider the quality of your pool table and what materials were used to make it. 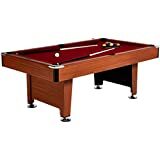 The materials used are an important consideration because they determine how long your table will last, how the balls roll and how fast and how sturdy your table is. Slate is the most common material for the playing surface of a pool table. It is also the only surface sanctioned by the Billiards Congress of America or BCA. Slate is easily ground into a perfectly smooth surface, which makes it ideal for billiards tables. Slate is heavy and is usually used in tables weighing 450 lbs or more. However, the slate’s mass keeps the table from swaying as you lean against it to make a shot. The slate on your pool table can be anywhere from 3/4” thick to 2” thick. BCA requires regulation pool tables to be made from 1” thick slate, sectioned into 3 pieces. The one-inch thickness allows the balls to roll more smoothly on the table and provides more bounce. Dividing the slate into three sections makes it much easier to move the table and it makes the table much easier to level. Poplar is the most common and the most suitable choice for the wood used in the framework of your billiards table. Poplar is a type of hardwood. It’s ability to “self-heal” makes the wood contract over screws, holding them firmly in place. The wood also heals itself when staples are removed. For the table’s exterior, woods such as maple, mahogany, and oak are used. These woods are resistant to scratches and offer an aesthetically pleasing look. Some higher-end pool tables feature ornate, carved legs and sides. Another material that will affect the roll and the speed of the ball is the felt that covers the slate on the table. Felt is the most common material used as a covering for billiards tables. It is comprised of approximately 60% wool and has a “fuzzy” feel to it. Felt starts “pilling”, or shedding, with age and use. Another covering that can be used on pool tables is worsted wool. Worsted wool is made from the highest-quality combed wool and manufactured on special machines, made specifically for producing billiards cloth. This cover does not feel “fuzzy” at all, it feels more like the material of a finely woven suit. The sleekness of the covering allows the ball to roll faster and much more accurately, which earns it the nickname “speed cloth”. Worsted wool can be expensive and is usually only found on professional tables or on in-home tables where the owner demands the highest quality table. 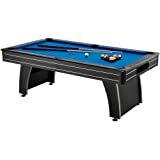 There are certain features on a pool table that ensures your table is top quality and will last for many years. If you cannot examine these features for yourself, ask the seller about the feature. A reputable salesperson will be able to answer any questions you might have about the table. Features of A Quality Frame: A quality frame should be made from solid wood. The screw holding capacity of a solid wood frame is what will keep your table held together through several years of use. Frames constructed from plywood or particle board should be avoided. Features of Quality Rails: High-quality rails should also be made from solid wood. Rails made from particle board will start to come apart when replacing worn items such as cloth and cushions. Solid wood rails will also affect game quality. Balls tend to rebound faster off of solid wood rails, making the game more exciting and enjoyable. If the top rails are laminated, make sure a high-pressure, burn and scratch resistant laminate was used. This type of laminate will increase the longevity of your table. Features of Quality Cushions: Cushions should be canvas-backed, full profile K-66 cushions. Cushions that are canvas-backed adhere to the rail better. Grade A rubber is the best quality material and provides the best ball rebound. Features of Quality Slate: Slate should be diamond-honed for the smoothest and most level playing surface possible. If the slate is cut into three sections, ask your salesperson if the slate is matched and registered. This means that the sections are cut from the same slab. Brazilian slate has been proven to be the best and longest-lasting slate for pool table use. Generally, the thicker the slate, the better. 3/4″ is adequate, but 1″ is preferred. Features of Quality Cloth: Cloth should be made from an 80/20 wool/nylon blend. The cloth should weigh 20 oz. 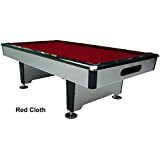 Features of Quality Legs: The legs of your pool table support a lot of weight. The average slate pool table will weigh over 450 lbs. Sturdy, well-constructed legs are essential for a high-quality, long-lasting pool table. Hardwood is ideal because of its capacity to hold screws securely. A used table can save you a significant amount of money, but you should thoroughly inspect a used table before buying it. Check the overall construction of the table and be sure to inspect the slate for any cracks. How Will You Move Your New Pool Table Into Your Home? As previously stated, pool tables are extremely heavy. 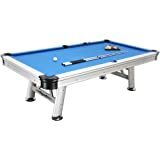 It is best to have a professional pool table moving company transport and set-up your table for you. Improper handling can cause serious damage to your table.